Each week as we ship orders off to you in places as diverse as Bangladesh and Boston, we get to notice all sorts of patterns. More often than not, any week here at the farm will offer up a lot of mysterious patterns. As we notice the patterns, we often have no explanation for them. And when we ask ourselves things like, “Why so many Lilac Flower Essences out the door this week?” it’s really our way of saying we don’t know a lot about oneness but we do have proof of it. Even as we don’t understand what the patterns mean, we don’t doubt that these patterns reflect a oneness beneath the surface illusion of separation. 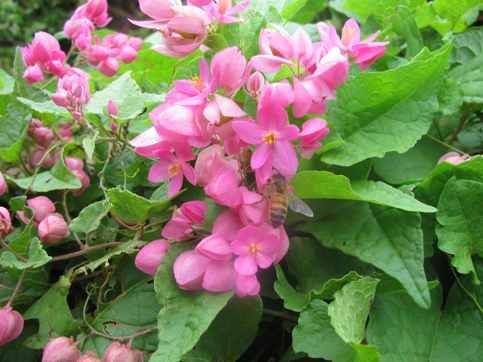 No one could pack orders here for very long before noticing that when there is a sudden interest in a particular Flower Essence in one place on earth, our oneness will mean that people from all over our dear earth are going to be ordering it as well. The fact is that when a Flower Essence that sits quietly on our shelves one week needs to be bottled in many, many batches the next, these patterns become impossible to miss. Take this week. The Alignment Garden has had a steady following since its creation several years ago. It goes off to lots of people each week. But this month, it is going out in a flood. The shippers hardly need to speak to me when they come out to the bottling room to request more of it. That’s our little bit of wordless oneness. A look says it all. And this week the look meant, “Molly, we need more Alignment Garden. What do I guess about this mysterious pattern, this surge of interest in the Alignment Garden mix? Well one thing I feel is that it’s good news. Just as Coralita offers her loving service to untangling profound gordian knots in our energy system, the Alignment Garden helps people get physically aligned with the accelerating vibration of the earth and their purpose here, and that’s a good thing. One Green Hope friend wrote us an email this week to tell us how the Alignment Garden and Belerephon of the Open Door, another powerhouse from the Venus Garden collection, had been the two Essences he felt helped him to leave a job he had hated for nine long years and leap into a new profession giving piano lessons. He sent us a photo of the gorgeous piano that had come into his life since he switched jobs and spoke with great affection of the many students he was now teaching. I loved hearing from this Green Hope friend. Everyone here has been lucky enough to hear wonderful Alignment Garden stories like this since its creation a number of years ago. This feedback means that all of us sending the mix off into the world this week felt heartened by the volume of orders for this mix. So much wonderful change afoot, and if we are lucky, we will get to hear tell of it from you all. Speaking of changes in alignment with divine purpose, after a lovely stretch with Olivia Fauver here in the office, her path is taking her on new adventures. A college student taking time off from her studies, Olivia was always someone I knew we we would have to let go of, sooner or later. Now a series of adventures in Arizona, New York City then Beijing have her taking flight. Some people’s alignment with their purpose involves a lot more airplanes than mine, and frankly I am glad mine seems to mostly involve trips to the bird feeder whereas for Olivia, I can see from the sparkle in her eye that alignment for her means journeys to all parts of the globe. In any case, as Olivia departs, I think of the synchronicity of her time here. In 1993 as a three year old, she spent the summer in the gardens while a bunch of adults including her mom shared the gardens with visitors. This was the season when we planted out first garden in the space we call the Venus Garden. This space has given us mixes including the Sunflower Spiral, Phoenix Rising, Loving What Is, Don’t Worry-Bee Happy, Love Prevails and yes, the Alignment Garden. In 1993 when Olivia was first here the garden and combination Flower Essence mix we made from the garden was called the Eight Garden. And yup, when she returned to us 17 years later to work here, the garden and combination Flower Essence mix we made from the garden was called…the Eight Garden once again as we took this transformative magical expansive mandela forward into a new variation. That was a pattern we all enjoyed, though I certainly hope we don’t need to wait 17 more years to have Olivia return to us. 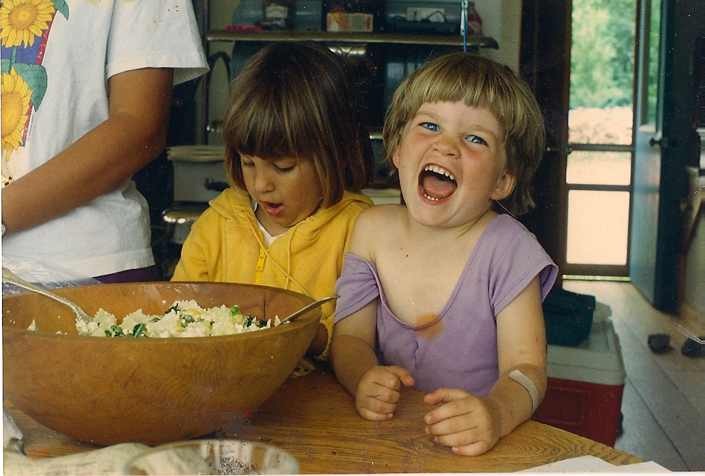 Here Olivia is at age three, lunching with Emily during the wild summer of 1993 when we were aligning with a mysterious plan for all things Green Hope Farm. Emily is probably going to shoot me for posting this picture. Even as a blonde pixie of four, she was a woman with a spicy attitude. But I just can’t resist posting this! The moment seemed pretty mundane at the time. We were feeding the little children and gardeners some lunch as we prepared to welcome afternoon visitors to the gardens. I didn’t think about how this adventure would unfold or how these two might become an integral part of it again two decades later. Apparently they weren’t too concerned about this either! Yes, the weather is always crazy, but everyone we talk to has particularly crazy weather stories right now. We are probably dealing with the most mundane of conditions with just a couple feet of snow on the ground and the usual January chill whereas so many of you have absolutely nutty conditions to report. 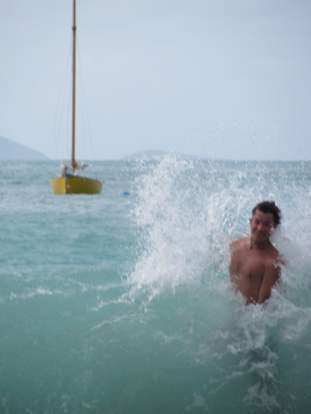 As I noted already, crazy weather had affected lots of things in St John. 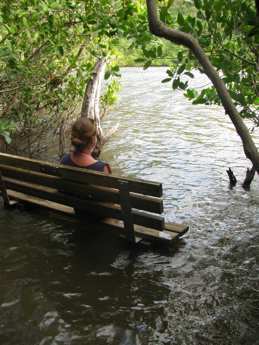 Here’s a bench that is usually overlooking a salt pond not part of the pond. The unusual weather on St John meant that some Flower friends were more abundant while some were long gone. One abundant friend spoke with me numerous times to say she wanted to help humanity RIGHT NOW because her gifts were perfect for the confused energies of this time. 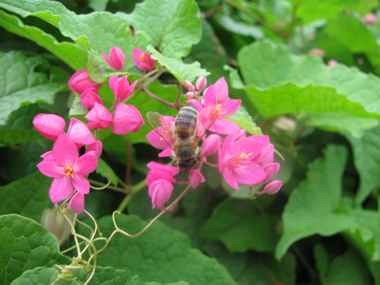 The Flower was Coralita. But the link is not enough! St John’s strange off rhythm weather didn’t impede this Flower from speaking to me loud and clear about its mission- It told me numerous times during my short stay on the island that it was a particular blessing to humanity RIGHT NOW. And today Coralita asked me again if it could call attention to her gifts and her desire to serve, RIGHT NOW! As a profound untangler of confused energies, Coralita has helped so many to unravel knotty problems and smooth out energy tangles in many places including the central nervous system. If you find yourself in a tangle physically, mentally, spiritually or emotionally, please consider Coralita. Not surprisingly given its gorgeous pink color, it offers its support with a light touch but it is also a determined ally. Dear dear Coralita. Such a love but also such a powerhouse! I hope like the honeybees in the photos you will take her up on her offers of support! Where Have all the Gardens Gone? Coming from a climate extreme in its seasonal temperature changes, I find tropical and subtropical places fascinating. What would it be like to be able to grow fruits and vegetables all year round, not just in the brief growing season we have here in northern New England? The notion of citrus, avocados, mangos, bananas and other tropical fruits right in one’s own backyard amazes me. Which is why I am always so puzzled that when I travel around St John, it appears that very few people bother to plant any of these trees for their own benefit, and when I pester people with questions about these plants, few seem to know or care about them. Things grow so very fast in a tropical environment like St John. One could have fruit bearing citrus trees in just a couple years and vegetables could be there for the harvesting year round, yet on St Thomas and St John I saw only one vegetable garden. The one vegetable garden I found was at the Annaberg plantation ruins in the USVI National Park. During all my other trips to St. John, the demostration garden at Annaberg lay fallow, but this time a lovely man had brought back the fruit and vegetable patch and was growing soursop, passionfruit, bananas, sugar cane, papayas, and other traditional fruits and vegetables. He recognized me as a farmer, perhaps because I was embracing each plant like a long lost cousin, and happily took me on an extensive tour of his garden creation. Had luggage size and regulations allowed, I think the dear man would have loaded me up with cuttings from every plant in his creation. During my trip, I heard tell of other gardens in the Caribbean, but not many. A magazine article I read on the plane noted that the Caribbean now imports $3 billion in food each year, and inter-island trade restrictions further complicate the situation, making it likely that the mango in my St John smoothie was not arriving fresh from nearby St Lucia but was a frozen import from the US. The article highlighted two chefs, one in Jamaica and one in the British Virgin Islands, who were trying to use only local organic produce at their resorts. Their tactics included stopping at every mango tree they could find to ask the owners if they could buy all its fruit as well as offering to pay people to plant vegetable gardens, promising to buy whatever they grew, no matter what it was. While I found the article interesting, it did not exactly seem like a green revolution, though that was the phrase bandied about in the article. There were, after all, only two determined chef profiled, both of whom described it as near impossible to do what they were trying to do: serve local foods grown by local people. I am sorry, but that feels wrong to me. My concern about a region that can grow its own food but doesn’t isn’t just about disappointment that others are not interested in plants the way I am. A community that grows its own food has a measure of security and self sufficiency that is lost when the growing of its food is given over to people far, far away. When jobs shift from growing food for local people to taking care of tourists, the situation grows exponentially worse. The last time I was in the Virgin Islands, three years ago, there were seven cruise ships in St. Thomas’s Charlotte Amalie harbor during Christmas week. This year there was one. The economy of the region is completely dependent on the travel patterns of people living thousands of miles away, and those people can’t afford to travel as they could several years ago. An island with no food production and dependent on shipments of imported food and steady infusions of tourists for its very survival doesn’t feel grounded or secure to me. It feels like a place hoodwinked into taking care of the wrong things like hot showers for visitors that may or may not show up. One night during our stay, the power went off on St John and St Thomas. A backup generator made dinner possible in the campground dining pavilion, but civility was in short supply among the campers. In a campground, I had expected people to be able to go with the flow a little better. We all had flashlights and they were feeding us. What was the big deal? I could only imagine how things were going down the way at Caneel Bay, the high end resort on the island. On our way across St Thomas to the airport for our return trip home, we passed FEMA headquarters. Short term help is in place both for the occasional power outage and for hurricanes. But what happens if travel patterns change for good? If I was a person living on St John, I would be up at Annaberg learning all I could from that lovely gardening gentleman, and I would take his cuttings too and get my garden started. And back here at the farm, I am thinking about how to extend our growing season and how to grow more of our own food. It’s not just about security to me, but about something deeper. Somehow, growing more of our own food makes me feel more grounded in my own life and more grateful for all its particulars, even the extremes of temperature. If you have read my posts for any time at all you have probably noticed that a big expedition for me is a trip to the Meriden Post Office. In fact, when our December holiday began, it had been three years since I had spent more than a night away from the farm, and frankly, I was overdue for a rest as those of you who received one of my goofed up orders will no doubt attest. Since it is easiest to rip me away from my gardens when they are under two feet of snow, Jim took his extraction window of opportunity and whipped our clan off to the island of St John, USVI for a holiday camping extravaganza at Maho Bay. Extravaganza was NOT the word that the women gathered at midnight in the campground’s communal bathroom would have used to describe their time at Maho. I imagine most of us women spent at least a few moments during the wee hours of the night wishing we had the anatomy of our menfolk, ie those guys back at the tents peeing off the tent platforms with the panache of pirates on the high seas. Meanwhile, for us women, Depends adult diapers drinking no liquids after 3 in the afternoon seemed like a more agreeable option than our 2 am strolls up the campground stairs and boardwalks to our shared toilets. Adding insult to injury, some clueless man had left an obnoxious diatribe pointers about toilet paper use at the campground in which he suggested two squares of toilet paper were ample for all situations. Let’s just say that the spunky grandmas I ran into at the bathroom in the middle of the night would have known exactly what they were going to do with their allotment of two squares, and they were unanimously going to use it to silence that ECO-JACKASS it didn’t involve a toilet. Anyone who thinks of a trip to the post office as a break from routine is obviously someone who doesn’t get out much….. so calling myself an inexperienced traveller is an obvious understatement. To put it mildly, once I leave the farm and sometimes when I am still here I am a stranger in a strange world. So while I have just complained about my midnight walks to the bathroom, I really have few complaints about our recent trip. Practically everything struck me as wildly exciting. 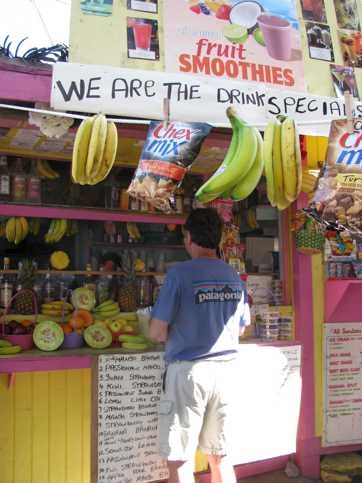 With a smoothie machine on every street corner, I was still THRILLED with my tropical passion flower guava mango smoothie at the stand across from the Cruz Bay Post Office. It felt special, in part because I didn’t have to clean the blender afterwards but mostly because just standing outside in the bright sun while someone made me a tropical drink seemed so wildly improbably. Here at the farm, there are maybe two hours each summer when making a smoothie outside sounds like a good idea. Did you catch my mention of a post office again? Apparently, post offices are my reference point in any new world. I guess you can take a woman with a mail order business away from her local post office but you can’t take the post office out of her. Is it any wonder my children worried about my mental health when I got excited about Cruz Bay’s zip code of 00830. Only I could find this low number fascinating, even mysterious. My postal obsession went so far that I actually introduced myself to the ladies at the Cruz Bay Post Office and took their picture to show MY post mistresses. What can I say? I found it enchanting that the postal mistresses of Cruz Bay processed their holiday packages OUTSIDE under a lignum vitae tree! Leaving Cruz Bay and up the windy dirt roads to the campground, we settled into our tents overlooking the blue green waters of Big Maho Bay. There was something blissful about Swiss Family Robinson housekeeping. A few pieces of already soggy clothing took up a small shelf, no possessions beyond a few seashells littered the place, and there was only a bit of sand to consider sweeping out of the tent (In an act of compassion, I left the sand be). During our first trips to Maho, back when I was a confused young mother who didn’t understand that any vacation was supposed to include me, I cooked for us in our tent. This time, we ate in the dining pavilion with other campers and during picnic lunches I didn’t even cut the sandwiches in half for anyone or even notice if the rest of the crew ate anything or stayed hydrated. This made life sooooooooo sweet. No cooking. No back seat cooking. No dishes, 76% 89% 97% of which I had no role in creating. No frantic scrambling at 5:50 each night to figure out what to cook for dinner. My mind could be a complete blank when it came to meal planning and just about everything else. This left so much delightful time to make new friends- Leeanne, Dave and Maya! We are so glad we met you! And speaking of friends, it was also a joy to visit beloved old tropical Flowers friends again. This year, because of an unusual amount of rain, there were also many new Flowers to meet for the first time. I hung off the back of the various open air taxis, luxuriating in every roadside weed while my children rolled their eyes and Jim looked alarmed. On one expedition to the other side of the island, I asked our friend Hamilton to stop his open air taxi at the Love City Mini Mart in Coral Bay. While he assumed it was so I could join the throng inside to stock up on rum, it was really because I wanted to visit some Flowers I had seen last trip in fields surrounding the place. 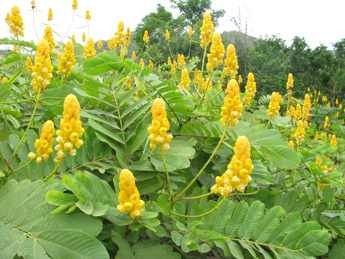 This time, I was in for a treat as the muddy goat filled parking lot of the Love City Mini Mart was encircled in candelabras of yellow Flowers, Cassia alata also known as Christmas Candles. Because the seas were rough and the skies overcast from all the storms in the north, the water was too murky for much snorkeling but it was lovely for body surfing, and we stayed in the water riding waves until our fingers and feet were numb or in Jim’s case, until a rib was cracked. The cooler conditions also meant we spent less time doing skin cancer research lounging at the beach and more time hiking. This was a whole new twist since in past trips the only hike I had taken was the midnight one to the communal bathroom. This time we walked to some wonderful places. One trail took us to a copse of bay rum tree whose crushed leaves filled the air with a wonderful bay rum scent. This is the kind of obvious remark that worries my children. Apparently only I get excited when a tree smells like it should. And because St John is nothing if not dramatically hilly, most every hike delivered one glorious vista after another. Even after many trips to this island, I am always surprised by the way the British Virgin Islands and the US islands sit dramatically cheek by jowl in a sparkling sea. Let’s face it, sometimes the obvious is just so darn amazing. One day saw me and Jim hitchhiking across the island on a mission to get to a place we couldn’t walk to. I hadn’t hitchhiked in thirty years but on St John it is practically di rigeur. And so I found myself feeling young and bohemian again as I rode in the back of a truck, talking with a most lovely St Johnian, What fun to sail down a mountain road in a stranger’s pick-up with a beautiful soul stirring the pot of my understanding about life. But all trips come to an end and after more no see’um bites than I could count and some very silly nights playing whist in our tent, it was time to head home with a dozen, three dozen forty six Flower Essences. I may be the only person who returns from the Caribbean with more potions than Harry Potter and Hermione Granger. I will look forward to sharing all the Flower Essences collected in our island meanderings. But today, it’s time to help the crew catch up on back orders! Our post mistresses may not be waiting under a lignum vitae tree, but they ARE waiting for our packages and so are you!